Whether you teach a regular children’s Bible class or tutor in a Bible based program, your ultimate goal with your students may not have occurred to you. If you don’t set concrete goals for your class, I encourage you to do so. If you do, your goals may range from making sure they know the stories from the Bible to hoping they commit some Bible verses to memory to praying they pass their next English test. What you may not have thought about much is the real, ultimate goal for your students. What is it? Your number one goal for every student in your class is to do whatever you can to help each of those children to get to heaven. While you are not personally responsible for the choices your students ultimately make in life, you are responsible for helping them to have the tools they need to make those godly choices. 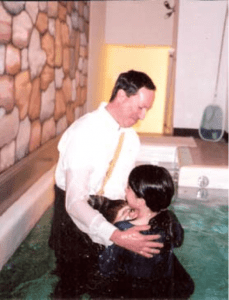 One of the most important choices any of your students will ever make is whether or not to be baptized and give their lives to God – becoming a Christian. The age of your students will determine whether or not they are ready for this important decision and every child is slightly different. Teachers often shy away from teaching children about baptism for fear of upsetting parents. While I do not advocate guilting or scaring a child into a decision they are too young to make, I don’t believe the topic should be excluded from your class either. The baptism study is designed so you can go through the materials without the activities for a student who is ready to become a Christian or you can use the activities to lengthen the study for a student who may not be quite ready to make the decision.The activities can also be used after a student has been baptized to help them strengthen their knowledge and faith. There are even additional scriptures in the leader’s guide should your students want or need more verses on a particular topic. So click on the link below (if you haven’t already used a link above) to access this important material. It can help you reach the ultimate goal of your class. I pray you will take up the challenge and do whatever you can to help every one of your students have the tools they need to become Christians and live an active, productive Christian life. Click here to be taken to the page linking you with our free baptism study and leader’s guide. Previous Is Hands-On Teaching Worth the Effort?